In 2009 Magic Falls Rafting Co. was the first outfitter to offer a high-adventure, action-packed double run of the Upper Kennebec Gorge. To meet demand for this new trip, Dave founded a new company, Magic Rivers, dedicated to our adult thrill-seeking rafters. We raft the five mile Upper Kennebec Gorge through Class III-V whitewater, take out at Carry Brook, return to Harris station and ride the Upper Gorge again. After take-out at Carry Brook, we return to base camp for a hearty barbecue. The Multi-Gorge Adventure is offered any day including high water release days. A minimum of 8 passengers per trip is required. We will try to combine passengers from different parties to qualify for the minimum. A fee of $10.90 per person will be charged to cover the State of Maine River Access Levy and meals tax. Or... Try our Cheap Thrills Trip Arrive at 9:00am, raft the Upper Gorge and return to basecamp by 1:00 pm. Bring your own lunch and refeshments and use our picnic area and recreational amenities after the trip. 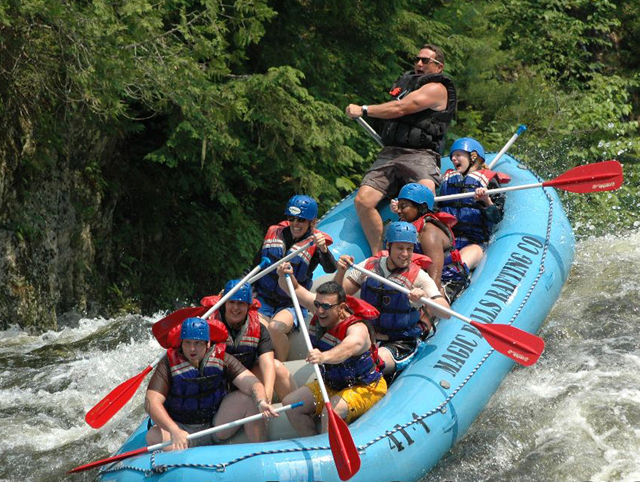 A great way to experience Maine rafting while saving time and money. Trips are subject to availability. $44 per person plus access fee of $5.90. Minimum age 10. Call-800-207-7238 for trip availability, book on-line with our reservation form or complete the on-line Plan Your Visit Form.